Twice in my life, I have been at a meeting where a French person has stood up and said very seriously that it is obvious that French should be the global form of communication since French is the most logical of all languages. Anyone with even an elementary knowledge of French (as spoken in France) will be aware of the fact that in order to say ninety-seven one has to crawl through mathematical hoops and phrase it as “four-twenty-seventeen” (quatre-vingt-dix-sept). I could in fact have picked any number from eighty to ninety-nine to make the same point. The sequence goes from four-twenties (80) through four-twenty-six (86) and four-twenty-eleven (91) all the way to four-twenty nineteen (99). Actually, this whole business starts even earlier, in the seventies, which start with sixty-ten (70) and end with sixty-nineteen (79). You can’t get away from word clouds by now. Tags, authors and names get pasted into swirls and displayed in patterns everywhere. The presidential and vice-presidential debates were followed immediately by a pictorial analysis of the words most frequently used by each contender. So my subject is not a particularly original thing to write about. But some time ago I came upon a page called Wordle where you can generate word clouds by pasting in text or linking to a website with an RSS feed. I thought it would be interesting to learn something about the way I wrote myself and so I pasted in the English text from my book The Observation Car. The result is here on the left. For those who are new to word clouds it might be worth pointing out that the higher the frequency of a word in a given text the bigger it will appear in the word cloud. 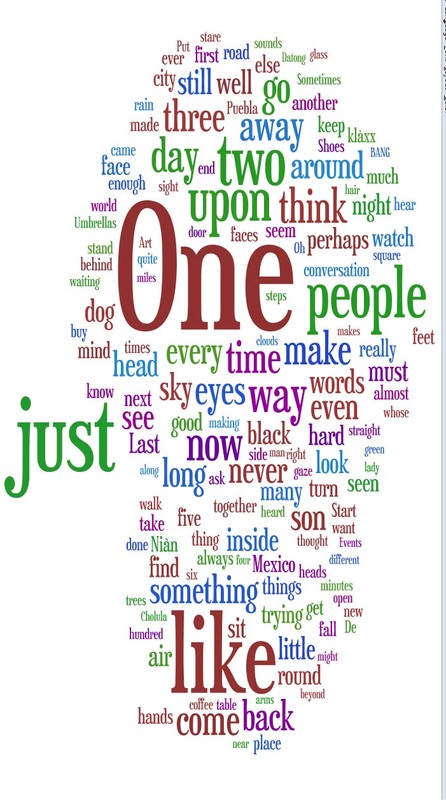 “One” seems to be my favourite word, though it is so common and can be used in so many ways that I think it could have been filtered out along with “and”, “a”, “the”, “which”, etc. “Two” and “three” also get a fair share of hits, but then my numbers peter out, though “five” puts up a shy hand. I should obviously put up a sign on the wall behind my computer to remind me how prone I am to using “just” and “like”. I find it interesting that going through the arrangement of words as you would pick up nails or beans scattered on a floor, it seems to come natural to put together clumps of pidgin haiku fragments. Rain made three go away, another keep shoes. Klaxx ! Bang ! Door faces seem oh !